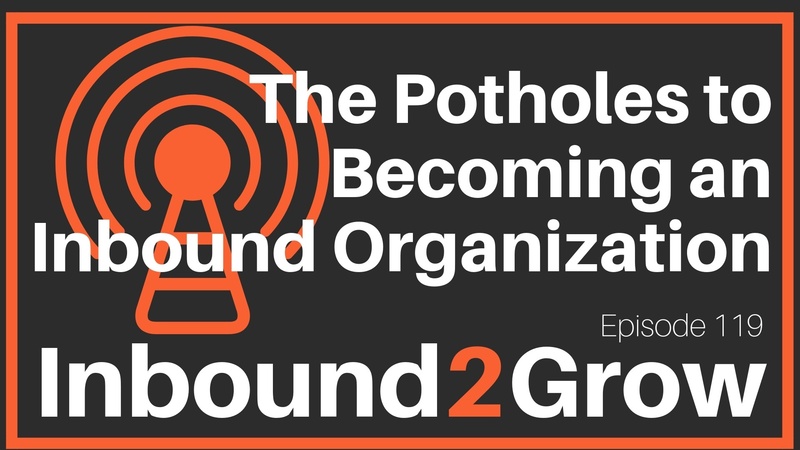 Episode 119: What are the Potholes to Becoming an Inbound Organization? At the beginning of every organization's journey to becoming an inbound organization, there are inevitable potholes in the road. The good news is that these potholes are completely normal and can be overcome. Potholes to becoming an inbound organization can look like strategy mistakes, content pitfalls, sales stumbles, or mission blunders. Whatever potholes your organization finds in its road, the most important thing to remember is that they represent opportunities to become a better inbound organization and there is no need to fear them. [0:39] Question: What are the Potholes to Becoming an Inbound Organization? Every organization will inevitably run into some form of pothole. Not every organization will run into every single pothole, or even most of them, but over the years there have been some common potholes we’ve seen. One of the first potholes organizations can run into is skipping their mission. We’ve talked a lot about the importance of mission, but for some companies taking the time to create a mission can seem like a waste. Or, worse, they’re an older company, and they think that just because they wrote a mission fifty years ago, it’s still relevant today. A mission has to be focused on how you are going to serve your customers. Typically, a mission will serve you for three to five years, but a 100-year-old mission is unlikely to reflect modern buyers, their needs, or the best way to help them. Your mission needs to be more than a statement on the wall. Another pothole is neglecting strategy or valuing tactics over strategy. You should be using an inbound operating system to keep everyone on track and focused on your mission. Your MSPOT should be clearly communicating the plays you will be making to achieve your overall strategy, and your inbound culture should be creating an environment in which everyone in your organization is working toward the same goals. If any of these pieces is missing, there are going to be problems. If that’s the case, don’t worry. Take a step back, figure out which piece is missing or failing you, and work on it. You need to take the time to establish these building blocks of inbound before you rush out and act. Content Strangulation – The inability to put out content. Often the content creation process is a bureaucracy-heavy process that creeps along at a crawl. This long, drawn-out process doesn’t add anything to the content. Content should be a part of your everyday life. Do make sure it is well written and polished, but don’t get so bogged down you never put anything out there. Content Asphyxiation – This happens when you have taken the fun out of content and are taking it too seriously. You don’t have to be the next great American novelist to create content. Your content should be useful and relevant to your prospects. The goal is to help, not win writing awards. Content Discombobulation – This is when your content is all over the map or focused too heavily on one kind of content, all top of the funnel for instance. Content should be matched to every stage of the buyer journey, and you should have plenty for each stage. Sales is another area of common potholes. It used to be that the goal of sales was to close deals, and we’re still seeing sales people pick up the phone and qualify. An inbound organization strives to start relationships, and you should know who you’re talking to before you pick up the phone. Not having your customers best interests in mind is another sales pothole. Not every prospect would make a good customer, and you should have their best interests in mind and let them go. Similarly, not letting the customer move at their own pace through the sales funnel is a common sales pothole. If your prospect is in the education phase of their journey, don’t try and close them. Don’t fear the potholes! Everyone experiences them, but they aren’t the end of the world. Take the assessment and submit your MSPOT and you’ll be able to progress through the pot holes. Start at the beginning, follow all the steps, and don’t skip any steps along the way. You can’t skip mission, culture, strategy, or anything else because everything builds on each other.